Event day started early with me and my merry men. Two of whom were sent by Shure UK and Shure Germany to help and watch in awe of what I was attempting, also to make sure I didn’t mess it all up 🙂 – I really needed all the help I could get dealing with this many microphones. We started by running out antenna cable and getting them cleared by the location manager – remember the site was open to the general public. With the rear two antenna rigged up we started doing some range testing and to check the head amps were providing the required gain. We could now get the front antenna up and leveraging some help from the various companies on site. We secured some excellent multi-segment stands to lift the antenna 4 meters up off the ground. 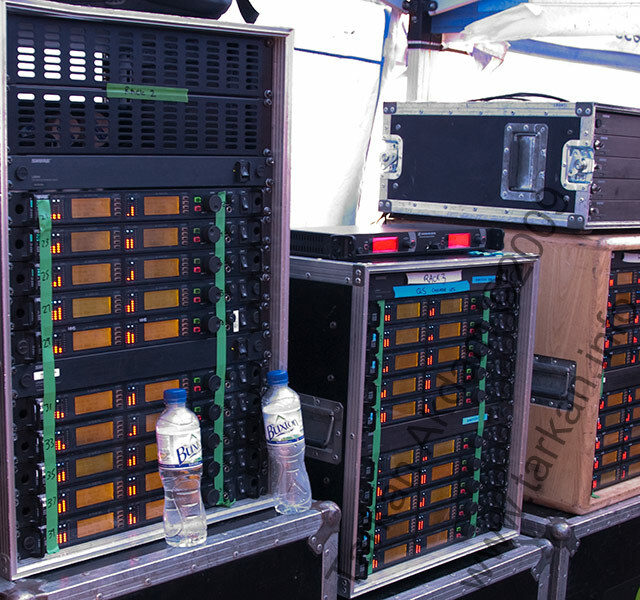 Now we could do some serious walk testing – as there was only 4 of us on the radio mics – we tested 10 microphones from each rack of 20 – so we ended up walk testing 80 microphones. Remaining mics were line checked in-situ to make sure they had audio coming out of them. 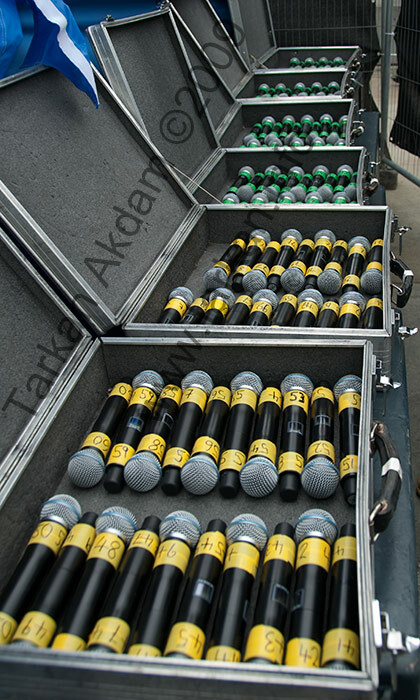 These mics are not cheap so we had 160 cast ‘mic handlers’ to stop the microphones going missing and also to help move the microphones around so more people had a chance to sing in to them. We had these people sign for the microphones on casting sheets – this was one seriously tedious task – signing the microphones back in was even more so – with a stampede to hand back the microphones. 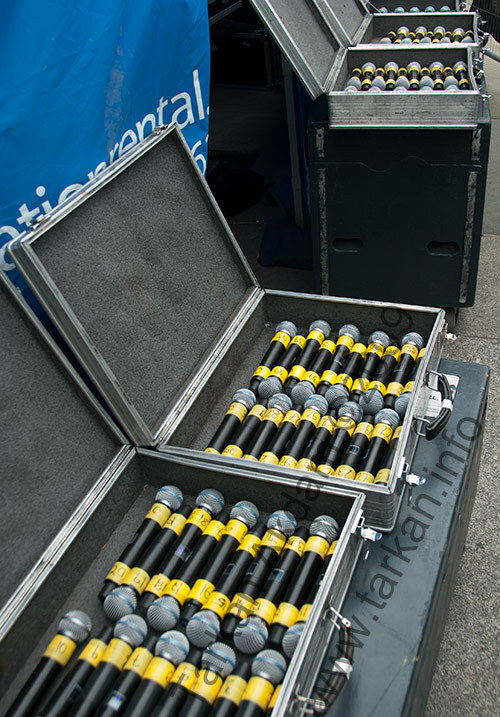 Sadly we still managed to lose 3 microphones – we think two were stolen, one seen real-time on camera. Event was great – the public really got in to it and you could see how much fun people were having. It is worth watching the high quality 4minute full sing-a-long on You Tube here. This event was very out of the ordinary. I have been doing what I do for many many years and have in my time designed / developed / made / worked on some funky things but this was very different. I like things to be well planned with no room for error. For this event I spent three solid weeks planning and taking in to account every possible issue but when it started I felt totally un-prepared. Not sure if it was the fact we had no rehearsal or enough time for setup and testing or if it was because once started it was out of my hands – what ever happens – happens and I would not be able to do anything if it went wrong…. Thankfully I can report nothing did go wrong – Pink’s mic worked great – the other 160 karaoke mics worked great. I had no intermod issues or any interference issues – I had some RF level concerns with people holding the microphones around the antenna, but that normally fixed itself as soon as people saw themselves on the big screen – they would lift the microphone up and start singing which helped the RF signal. 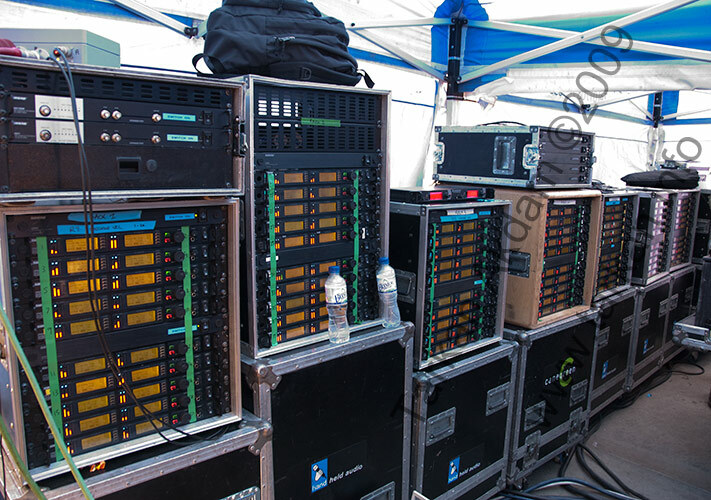 Having done this and the experience gained I think I could have squeezed in some more mics – taking the total number up to 180 channels and with some fine tuning to the Antenna system and some allocated rehearsal time I could even be persuaded to attempt 190 channels. Beyond the technical aspects of this job just the physical handling and managing this number of microphones was quite difficult and the general logistics of getting it all together was pretty intensive. Due to time constraints with this being a one day only event and the shoot lasting only 1 hour 20 minutes – one high pressure gig!!! All I got to do now is try and get a better upgrade deal from T-Mobile…..
← The Ultimate GPS Solution for Nikon? At least Pink didn’t use any in-ear! Really enjoyed reading! 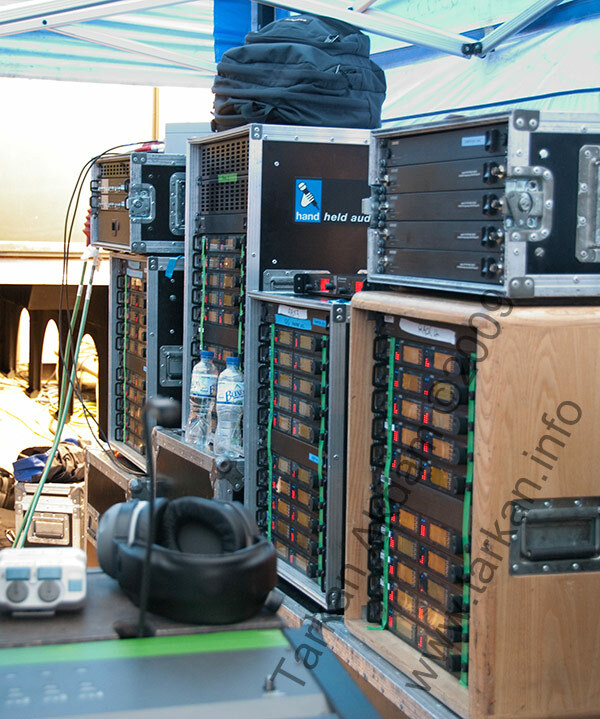 I have been wondering for some time now how on earth the sound crews did it and now I know. Good job! That was great, I tried to sing a song too but I think the emotions took their toll on me!